In January of 2014 a so-called incident in a highly-regarded institution received quite a bit of media attention, and the inevitable stretched latitude of comments from the land of virtual opinions. Let’s, for a moment, forget the potential negligence of the caretakers, the people ostensibly in charge, and examine instead the ramifications of Sissi Belle’s climbing on Donald Judd’s sculpture, Untitled (1980). Criticism ranged from responsibility and reverence, to value and etiquette, to historicity and power, to design and authenticity, to innocence, play, and anarchy. Maybe some of these weren’t actually discussed, or at least their surfaces were only scratched, but they are there, active, and there is room for their discussion, individually and as part of a complex network of forces at play that day and in the aftermath. 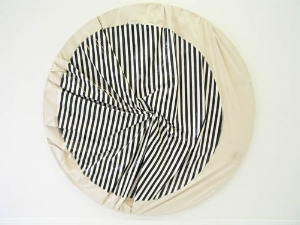 Sissi Belle’s puncture- rupture in etiquette, cuts a Steven Parrino straight line across it all, making untaut the surfaces, a discontinuous and aberrant irritant, a tiny body. She, unknowingly, as children often do, plucked the supporting cards from art and authority’s grand yet precarious castle. I’m not necessarily advocating for chaos, but Sissi’s mischievousness peels the skin back, furnishing a surgical examination of custom and normativity. Sissi is Hakim Bey’s poetic terrorist. Sissi has enchanted our conceptual landscape, intensified our consciousness, but pissed us off a little in a way that feels corrosive, improbable; something I hope to enable inside and outside the classroom, consistently. Because ya know, Kids say the darndest things. And sometimes they’re right. When a clothing rack that sells the things adults wear- the things that are so entangled in purely adult systems, things that adults want and only get because important adults who own the adult stores have contracts with less important adults who make the things that get moved on boats and planes captained by another group of adults, eventually arriving and then sold by sales associate adults- becomes a portal, or a fort, or a barricade, or a place of mischief, and our adult world upends. We can’t find our children. They are missing. Who are these potentially missing children and, in the classroom, can we help them go missing? Do we still facilitate their finding of spaces to become lost in? Or, and this is my insider’s hunch, do we give them “tools” that foster pragmatism, obedience, and productivity despite existential sabotage. An Asian-fusion restaurant of watered down creativity meant to help them creative problem-solve out there in the real world? I’m sure it’s not all bad, I know it’s not, but if this becomes educators’ guiding ethos then we’ve not only crippled our own abilities as conceptual rabble-rousers and educational hooligans, we’ve packaged our children’s minds for the close quarters of capitalism. Similarly, Eva Rothschild, an Artist, shows us the potentially catastrophic or revolutionary destruction a loosed team of boys can impart on objects of significance. In another highly regarded institution, an installation of variously modern looking art objects quickly become playthings and the victims of preadolescent shenanigans. The resulting video shows things quickly evolve or devolve into total lawlessness or youthful mutiny. Might this also depict something more political; a larger anarchic training ground? What might Duchamp say? What might Duchamp’s kids do? Is this just boys run amok? Boys are famous for running amok and, at times, all over things we hold in high regard. Books are burned. Relics are smashed. Bodies brutalized. These are not good things, are, in fact, terrible things. So, how amidst these decidedly divergent energies can I possibly develop and position my own pedagogy? Well, to start with, this binary I’ve constructed is misleading at best. The universe encapsulating these two behemoth poles and the fertile stretch between them is incredibly nuanced, unpredictable, irregular, defiant, queer. Likewise, My relationship to my own self has been fundamentally altered as corresponding duties are performed and the elasticity of professorship is tested. Performance, and I do mean performance, lies at the very heart of classroom interaction. Each enacts a role and each enacts that role based on codified behaviors, expectations, social norms, respect, fear, inquisitiveness, empathy, etc. The point is, archetypes, bottomless origin myths, precede every role-destination. A: I’m relatively new to teaching, having spent three years as an Assistant Professor at a Research 1 Institution in the Midwest, moving on to run a department at Research 1 Institution in the South for another year. B: Having acknowledged, formally, the forms and shapes of new perspectives in a hopefully more experimental pedagogical turn is to kill, crush, and maim the very essence that causes individuals to attempt an overhaul, a flexibility, an inciting of institutional hysterics. Our worlds aren’t our worlds until we acknowledge them with words and deploy those terms to do what they’ve been designed to do: Make every thing listen, streamlined, recognizable, attainable, domesticable. We know words mean things, at least to us. They mean more than they mean. They indicate. They differentiate. They demarcate. So maybe, as some kind of linguistic panacea, we can find a degree of comfort in the anachronistically evocative term “hysterical” which, at one point, was taken to identify the purported crazed irrationality of women, a tool used by men and institutions to exercise control and naturalize patriarchy. So then how would resuscitating this term, which incorrectly and maliciously pathologized normal physiological responses and typical human behavior to assert personal, political, corporeal, and institutional dominance, function activistically, as a way to reclaim, energize and sew the aggressive etymological metamorphosis that speculative futures necessitate. It would be natural, spring forth from the soil; hysterical disruption is just what is needed, a spinning, reeling, disorderly kind of thinking. When we formalize the feral, the impulsive, the hysterical, the resistant qualities of experimental thinking, we pour the foundation of a tradition and begin to shore up possibilities with the curriculum-izing forces of the institution. Blood turns cold after that. A further expansion: You are never truly alone, nor is your warmth reliant only on your own furnace, as all thinking and actions are the aggregate manifestation of others’ thoughts, efforts, and histories absorbed into, exchanging, and uniting consciousnesses, materials, practices, and presences. This is important, as I tell my students, “You are never not collaborating.” The pervasive culture of egoism cripples our ability to understand the intricate networks that form contemporary life and a larger cosmological web. But, individuals do still operate at some level with their own apparent autonomy as propulsion. And aside from our shared substrates it is unique outlooks and individual desires that allow holes to be poked, narratives to be interrogated, and maybe reorganized. What’s more, it’s important to give students the imperative tools so that they may shed some of the self-regulatory anxieties that god and government’s panoptic presence imposes. They must, must, pick up their own tongues and exercise in ways and places unknown. They must fail, or at least believe failure is an option to uncover the uneven surfaces of conceptual play. And maybe what will be discovered is the potentially exceptional quality in the singular, the individual, and then, the human that feels and so acknowledges the +1 of interdependency and mesh-cosmologies. So, what as classroom leaders can we expect of ourselves? Are we model-citizens? Are we to be looked up to? What to do? What to avoid? Academics are doing, or have chosen what they do because they couldn’t do what they could have done, right, i.e. something more productive? Similarly the maxim, “those who can’t do, teach,” is perpetuated by the same kinds of reductive thinkers that allow words like “do” to go un-questioned. What is do? Do is the sum-total of market forces. Do is the unwavering ability to shirk the holistic nature of organisms in favor of eternal hedonism. Do is about you, or you as it performs the tasks laid out by those in power. Where does vulnerability come into play and does being a role-model necessarily avoid any of the amateurishness, missteps, or even failure? Should our students consider themselves disciples or should they understand their own agency and recognize that our playing field is fairly close to level and we’re all on 3rd base? It is a shared fault that our leaders are expected to always be good, to always maintain control, and to lead by unassailable righteousness. At best I can produce an environment that’s rigorous, open, and relatively safe; help students develop an embodied sense of the world and a willingness to witness and exercise rogue intensities. Which is, “Unlike historical fiction’s fact-based but imagined worlds, in parafiction real and/or imaginary personages and stories intersect with the world as it is being lived. Post-simulacral, parafictional strategies are oriented less toward the disappearance of the real than toward the pragmatics of trust. Simply put, with various degrees of success, for various durations, and for various purposes, these fictions are experienced as fact..."
Teaching, Listening, Guessing, has infected and affected my practice. To affect sets up an unfortunate binary- as if, me and them, my students, are in opposition. One is always learning from the other in a rather inflexible, unidirectional manner. That is not how it works, particularly as the speed of ideas and technologies accelerate we must all be instep in order to find plateaus for conversation. In this digital age, it is wise to approach a classroom of digital natives well aware of the gaps in your own experience. Is it possible to know enough to tell students something we surely don’t know? I’m pretty sure it’s not possible and definitely in us instructors’ best interests to listen. Feigning mastery only gets everyone into trouble and no one grows as a result. It’s ok. It’s good to throw a new way of seeing into the mix and besides, with the splintering of production our identities have been fragmented. Our vaginas and penises exist in other places, other times, other consciousnesses. Our orgasms, much like our realities, are impossible to map. These kids know and our nostalgia only acts as an impediment. Self-directed angst, it’s important. Professors should be prepared to hate themselves or be at least wary of what they might become. We should hate the indoctrinators, the inquisitors we’ve grown to become---because, we have grown, we have grown to become these people. We are products, products of the institution and even when the institution is pushed aside there is still the hand that acknowledges it as it pushes. How do I support these minds in the midst of mindlessness? How does one bring adults forward from children, from the media’s dastardly dedication to mis-information and myopia, or the malaise of privilege that stunts growth and shirks any semblance of awareness. Dada taught us much, taught us many, taught us nothing. Having learned nothing we should know that those somethings, the somethings that agitate common sense and normalcy, are things to interrogate, to exercise our suspicions against whole-heartedly. Normal is the day’s real fasicst. Normal watches us tucked just beneath the spectacle. Normal is a poison but so is life, and death is something we should get more used to. What are we teaching when my class of 15 undergraduates are incapable of recognizing Eric Garner’s plea for life. I just realized, I’m writing this and thinking about myself. So, as an artist, a term I struggle with, and as an educator the fundamental questions bubbling up here is, What are we, i.e. individuals being asked to qualify and quantify the impact of the what-goes-on-outside the classroom with the what-goes-on-inside, first; artists, educators. My suspicion is that most answers will sound decidedly utopic; we are everything, and each pursuit is part of larger thriving organism. Well, I ask another question, what do each of these terms really amount to outside of questionable questionnaire rhetoric? I’m an artist; ostensibly my goal is to gain notoriety and carve out my recognition within a market. I am an educator; presumably I am here to impart knowledge or facilitate experimentation, foster curiosity, empathy, and ideological vulnerability. What I’m being asked to do is quite different and attitudes, often times, seem like toxic departures from this essential thrust. Who fails when I fail? What fails when the institution fails? When does the institution fail? What do students not expect? What do I wish students expected? What do we, as students and mentors, think we can accomplish? How do we define accomplishment? Is there a darkness that’s more important? Are darkness and accomplishment similar? Aspiration might be the weird god-like product of capitalism, of supposed self-improvement. But what are the metrics we weigh such thing with and is happiness a sustainable pursuit? Who loses out when happiness is the goal?